Rickettsiae closely related to the Malish strain, the reference Rickettsia conorii strain, include Indian tick typhus rickettsia (ITTR), Israeli spotted fever rickettsia (ISFR), and Astrakhan fever rickettsia (AFR). Although closely related genotypically, they are distinct serotypically. Using multilocus sequence typing (MLST), we have recently found that distinct serotypes may not always represent distinct species within the Rickettsia genus. We investigated the possibility of classifying rickettsiae closely related to R. conorii as R. conorii subspecies as proposed by the ad hoc committee on reconciliation of approaches to bacterial systematics. For this, we first estimated their genotypic variability by using MLST including the sequencing of 5 genes, of 31 rickettsial isolates closely related to R. conorii strain Malish, 1 ITTR isolate, 2 isolates and 3 tick amplicons of AFR, and 2 ISFR isolates. Then, we selected a representative of each MLST genotype and used multi-spacer typing (MST) and mouse serotyping to estimate their degree of taxonomic relatedness. Among the 39 isolates or tick amplicons studied, four MLST genotypes were identified: i) the Malish type; ii) the ITTR type; iii) the AFR type; and iv) the ISFR type. Among these four MLST genotypes, the pairwise similarity in nucleotide sequence varied from 99.8 to 100%, 99.4 to 100%, 98.2 to 99.8%, 98.4 to 99.8%, and 99.2 to 99.9% for 16S rDNA, glt A, omp A, omp B, and sca 4 genes, respectively. Representatives of the 4 MLST types were also classified within four types using MST genotyping as well as mouse serotyping. Although homogeneous genotypically, strains within the R. conorii species show MST genotypic, serotypic, and epidemio-clinical dissimilarities. We, therefore, propose to modify the nomenclature of the R. conorii species through the creation of subspecies. We propose the names R. conorii subsp. conorii subsp. nov. (type strain = Malish, ATCC VR-613), R. conorii subspecies indica subsp. nov. (type strain = ATCC VR-597), R. conorii subspecies caspia subsp. nov. (type strain = A-167), and R. conorii subspecies israelensis subsp. nov. (type strain = ISTT CDC1). The description of R. conorii is emended to accomodate the four subspecies. Taxonomic classification of members of the order Rickettsiales was originally based on relatively few phenotypic criteria . Over the past twenty years, the taxonomic classification of the Order Rickettsiales has undergone many changes. On the basis of 16S rDNA sequences, Coxiella burnetii was reclassified within the Legionellaceae , Eperythrozoon sp. within the Mycoplasmataceae , and Rochalimaea sp., Grahamella sp., and Bartonella sp. within the Bartonellaceae, closely related to Brucella sp [4, 5]. Among the remaining members of the order Rickettsiales, the Anaplasma-Ehrlichia clade was recently reorganized into 4 genera ; and R. tsutsugamushi was reclassified into a new genus, Orientia . Within the genus Rickettsia, since the pioneering work of Philip in 1978 , two rickettsial strains were considered as having different serotypes if they exhibited a specificity difference of ≥ 3 and some authors have considered this to be a useful guide to speciation [9, 10]. However, opinions divide as to whether this holds true for rickettsial strains related to Rickettsia conorii (R. conorii) . These include Indian tick typhus rickettsia (ITTR) , Israeli spotted fever rickettsia (ISFR) [13–15] and Astrakhan fever rickettsia (AFR) [16–19]. 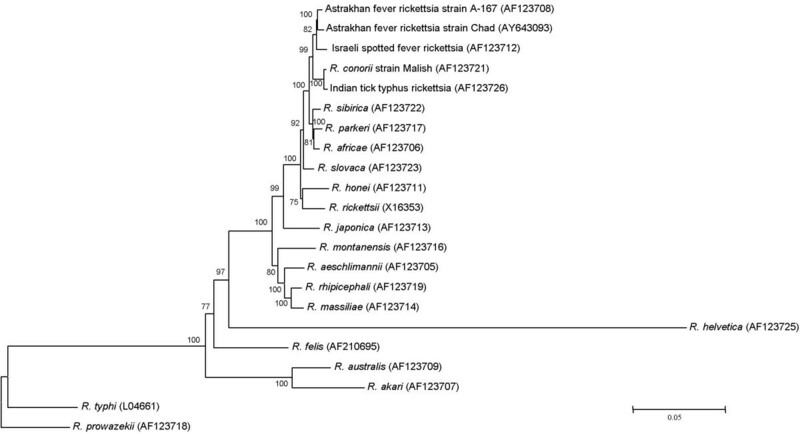 Phylogenetically, these rickettsiae constitute a homogeneous cluster supported by significant bootstrap values and are distinct from other Rickettsia species (Figure 1) [20–22]. Some authors have considered these rickettsial strains as different species and proposed the names R. sharonii and R. caspii for ISFR and AFR, respectively [23, 24]. Other authors believe that they belong to a "R. conorii complex" [11, 14, 15, 17, 19]. Unrooted phylogenetic tree derived from the comparison of sequences of the complete glt A gene from rickettsiae closely related to R. conorii and other validated Rickettsia species. The analysis used the Neighbor Joining method and the Kimura 2 parameter as described in the Methods section. Bootstrap values are indicated at the nodes of the phylogenetic tree. GenBank accession numbers are indicated in parentheses for each taxon. These rickettsiae closely related to R. conorii have been described as the causative agents of Mediterranean spotted fever, Astrakhan fever, Israeli spotted fever, and Indian tick typhus in the Mediterranean basin and Africa, Southern Russia, Middle East, and India, respectively. These rickettsioses are transmitted to humans by Rhipicephalus ticks . Furthermore, most of their clinical features overlap and are characterized by a febrile illness and a generalized maculopapular rash. However, an inoculation eschar is seldom present in Astrakhan fever and Israeli spotted fever but common in Mediterranean spotted fever (Table 1). Recently, we have proposed gene sequence-based criteria for the identification of Rickettsia isolates at the genus, group and species levels and proposed criteria to define species . Using these criteria, we have shown that ITTR, ISFR and AFR could not be considered as distinct species. Instead, they belonged to the R. conorii species . However, these rickettsiae exhibit differentiable serotypes and cause diseases with distinct clinical features in defined geographic locations. The ad hoc committee on reconciliation of approaches to bacterial systematics  has proposed that even if related genetically, bacterial isolates within a given species could be considered as distinct subspecies if they differed phenotypically. In this study, we undertook to examine whether phenotypic differences existed among various R. conorii isolates that would enable to classify them as subspecies. We estimated the degree of genotypic variabilities among 31 isolates of R. conorii, 1 isolate of ITTR, 2 isolates and 3 tick amplicons of AFR, and 2 isolates of ISFR using multi-locus sequence typing (MLST). We incorporated 16S rDNA and glt A genes, as well as 3 membrane-exposed protein-encoding genes omp A, omp B and sca 4 (formerly gene D) [26, 27] in MLST. To further characterize the specificities of distinct MLST types, we incorporated a prototype isolate from each of these into a multi-spacer typing (MST) assay, which we have previously demonstrated to be more discriminant than MLST at the strain level for R. conorii . Furthermore, mouse serotypes were obtained for each of these MLST types. All five genes studied were amplified from all 36 studied isolates and from 3 of 57 Rhipicephalus pumilio ticks tested. All negative controls remained negative. Four MLST types were identified. Within the first type, which we named Malish type, all R. conorii isolates exhibited identical sequences for each of the five genes tested except isolates Moroccan and M1. These latter isolates showed deletions of 24 and 156 bp, respectively, at the 5'-end of the omp A gene. The second type, the ITTR type, was made of ITTR. This exhibited unique nucleotide substitutions in omp A, omp B and sca 4 genes. Within the AFR type, all isolates and tick amplicons tested showed identical sequences of the five genes studied except the Chad isolate which showed subtle nucleotide substitutions in each of them. In this isolate, the pairwise nucleotide similarity with AFR for 16S rDNA, glt A, omp A, omp B and sca 4 genes was 99.7, 99.5, 99.5, 99.2, and 99.8 %, respectively. The fourth type, ISFR type, which included both ISFR isolates, showed the same nucleotide substitutions in each of the five genes tested. This differentiated them from other rickettsiae. As representative strains for each MLST genotype, we have chosen R. conorii isolate Malish, ITTR isolate Indian, AFR isolate A-167, and ISFR isolate ISTT CDC1. Among representatives of the four MLST genotypes, the degree of pairwise nucleotide similarity ranged from 99.8 % between AFR and ISFR to 100 % between R. conorii and ITTR for the 16S rDNA gene (Table 3). For glt A, such similarity ranged from 99.5 % between Malish (or ITTR) and ISFR to 100 % between R. conorii and ITTR. For the 5' end of omp A, the degree of pairwise sequence similarity ranged from 98.1 between AFR and ITTR to 99.8% between R. conorii and ITTR. This pairwise similarity ranged from 98.5 between ITTR and ISFR to 99.8% between R. conorii and ITTR for omp B. For sca 4, the pairwise sequence similarity varied from 99.2 between ITTR and ISFR to 99.9% between R. conorii and ITTR. The dendrograms obtained using the three different tree building analysis methods showed similar organization for the five rickettsiae studied. We identified two monophyletic groups with the trees so constructed. 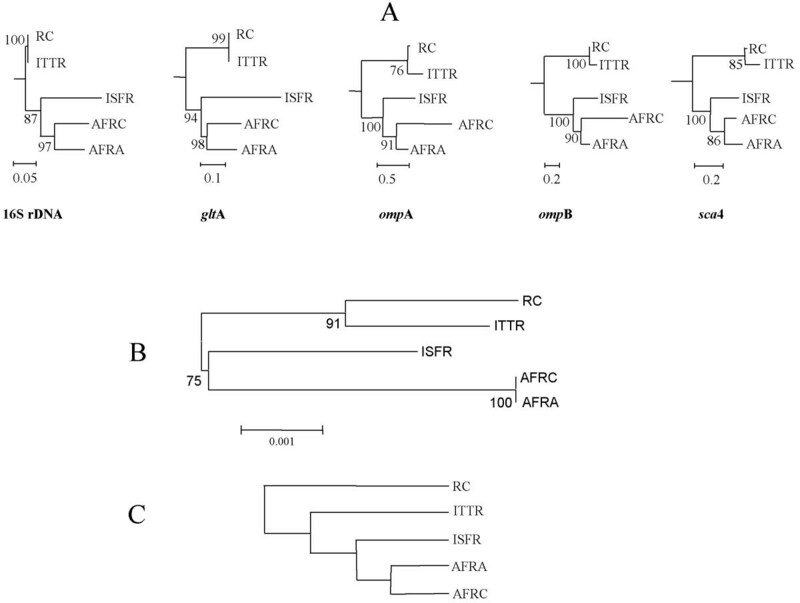 One included R. conorii and ITTR and the other, ISFR and AFR (Figure 2A). The clustering of these rickettsiae was supported by high bootstrap values. Both AFR isolates were grouped together for each of the five genes tested. A = Unrooted phylogenetic trees derived from the comparison of sequences of the 16S rDNA, glt A, omp A, omp B and sca 4 genes using the Neighbor Joining method (A). Bootstraps values are indicated at the nodes of the phylogenetic tree. The scale bars represent the percentage of nucleotide differences. RC = R. conorii; ITTR = Indian tick typhus rickettsia; AFRA = AFR isolate A-167; AFRC = AFR isolate Chad; ISFR = Israeli spotted fever rickettsia. B = Unrooted phylogenetic trees derived from the comparison of concatenated sequences of the dks A / xer C, mpp A / pur C, and rpm E / tRNA-fMet intergenic spacers using the Neighbor Joining method (B). Bootstraps values are indicated at the nodes of the phylogenetic tree. The scale bars represent the percentage of nucleotide differences. RC = R. conorii; ITTR = Indian tick typhus rickettsia; AFRA = AFR isolate A-167; AFRC = AFR isolate Chad; ISFR = Israeli spotted fever rickettsia. C = Taxonomic dendrogram of rickettsiae closely related to Rickettsia conorii obtained by using the unweighted pair group method based on reactivity of mouse antisera to all tested rickettsiae. RC = R. conorii; ITTR = Indian tick typhus rickettsia; AFRA = AFR isolate A-167; AFRC = AFR isolate Chad; ISFR = Israeli spotted fever rickettsia. ITTR showed unique 232-bp dks A / xer C (type P, GenBank accession number AY836513) and 153-bp mpp A / pur C (type F, AY836517) spacer sequences. However, it also showed a 200-bp rpm E / tRNA-fMet spacer sequence identical to that of R. conorii type B (AY345092); ISFR had unique 232-bp dks A / xer C (type Q, AY836510), 153-bp mpp A / pur C (type G, AY836514), and 200-bp rpm E / tRNA-fMet (type C, AY836518) spacer sequences; AFR isolates A-167 and Chad showed unique dks A / xer C of 232- (type R, AY836511) and 167-bp (type S, AY836512), respectively. They also showed identical 153-bp mpp A / pur C (type H, AY836516) and 200-bp rpm E / tRNA-fMet (type D, AY836519) spacer sequences that were different from those of other strains. When combining the genotypes obtained from each of the three spacers into a MST genotype, each of the four rickettsiae showed a distinct MST genotype. The MST genotype so obtained was different from that of R. conorii. However, on pairwise comparisons of the four strains, both AFR strains showed similar spacer types. The phylogenetic tree inferred from the concatenated spacer sequences showed an organization similar to that obtained from MLST when Malish strain was taken as R. conorii type strain (Figure 2B). However, the node where ISFR branched was not supported by a significant bootstrap value. When injected into mice, all five rickettsiae tested provoked antibody responses that were detectable by MIF. The endpoint titers and specificity differences (SPDs) were calculated as described in the Methods section. These values are presented in Table 4. The antibody titres obtained in homologous sera were at least one-fold higher than those observed in heterologous sera. The SPDs for heterologous sera varied between 1 and 5. Four serotypes were identified. These included R. conorii, ITTR, both AFR isolates, and ISFR. The dendrogram inferred from the matrix based on SPDs (Figure 2C) showed that ITTR occupied a position that slightly differed from its phylogenetic organization. Instead of forming a cluster with R. conorii, it occupied an intermediate position between R. conorii and ISFR (Figures 2A and 2B). MIF antibody titers and SPDs from reciprocal cross-reactions of mouse antisera to the members of the Rickettsia conorii complex. * Titers are the reciprocals of the highest dilution of antisera that gave a positive reaction. SPDs are calculated according to the formula given in the Materials and Methods section. We propose to create subspecies within the R. conorii species to accommodate both the genotypic homogeneity and the serotypic, MST genotypic, geographic and pathogenic diversities of rickettsia strains within this species. Defining a species within the Rickettsia genus has long been difficult but rickettsiologists have agreed to use mouse serotyping as one criterion . This classification scheme served as a basis for the development of genotypic criteria at the species level . However, confusion still exists about the taxonomic status of rickettsiae. This is especially the case for rickettsiae which are closely related to classic R. conorii isolates. Philip et al. , using mouse serotyping, have demonstrated that R. conorii isolates Malish, Moroccan and Kenya were closely related antigenically to ITTR and that they belonged to a single serotype. Using complement fixation, Bozeman et al. were unable to distinguish ITTR from R. conorii isolates. In contrast, others, using mouse polyclonal antibodies , and monoclonal antibodies , have demonstrated substantial differences between ITTR and R. conorii isolates. ISFR and AFR could not be distinguished using PCR-RFLP  until omp A was used as target gene . In 1993, we have demonstrated that AFR differed from both ISFR and R. conorii in terms of SDS-PAGE mobility and PFGE profiles . Although they are difficult to distinguish serologically, the cross-reacting epitopes they share are located on antigenic proteins that differ in SDS-PAGE mobility and hence in molecular weight . In 1995, Walker et al., using serotyping, Western bloting, monoclonal antibody reactivity and PCR amplification of the tandem repeats within omp A, concluded that ISFR belonged to the R. conorii species . In 1998, Dasch and Jackson differentiated R. conorii from ISFR using PCR-RFLP . Recently, using a combination of genotypic criteria, we have demonstrated that the genotypic differences among ITTR, AFR and ISFR were too subtle to classify them as new species . Instead, they belonged to the R. conorii species. In the present study, we have demonstrated, using MLST, that rickettsiae closely related to R. conorii isolate Malish are very homogeneous. Except isolates Moroccan and M1 which showed one omp A deletion of 24 and 156 bp, respectively, all studied R. conorii isolates had identical sequences for the five genes studied and thus constituted a reliable taxon. The ITTR isolate showed unique sequences of omp A, omp B and sca 4 genes. Among isolates and tick amplicons of AFR, the degree of MLST sequence similarity was of 100% except for the Chad isolate which is genotypically slightly different from AFR isolate A-167 . In another study, we have found identical omp A sequences in four tick amplicons from Kosovo and AFR isolate A-167 . We have also observed serologic, antigenic and genetic homogeneities among two tick and one human AFR isolates from Astrakhan . Thus, except the Chad isolate which was slightly different genotypically, AFR, with three strains and ten tick amplicons studied, appeared to form a homogeneous taxon. The two isolates of ISFR tested showed 100% pairwise nucleotide similarity in all five genes studied. As we have compared only two isolates, one may argue that this may not be representative of the diversity of omp A in ISFR. However, Walker et al. found four human ISFR isolates from Israel to be highly homogeneous antigenically as well as genetically . Bacellar et al. described three human isolates of ISFR from Portugal that showed 100% similarity in 16S rDNA, glt A and omp A sequence with those of ISFR isolate ISTTCDC1 . Giammanco et al. identified a tick rickettsial isolate in Italy that had 100% omp A sequence similarity with ISFR isolate ISTTCDC1 . Therefore, it appeared that our ISFR isolates were representatives of the same homogeneous taxon. In the first part of the study, we have identified four MLST genotypes which were subjected to further evaluation. Among representatives of these MLST genotypes, the minimal pairwise similarity in the nucleotide sequences of 16S rDNA, glt A, omp A, omp B, and sca 4 genes between the rickettsial isolates tested and R. conorii, was 99.8%, 99.4%, 98.3%, 98.5%, and 99.3%, respectively. Thus, All four isolates tested fulfilled the criteria to belong to the R. conorii species . Phylogenetically, the members of the R. conorii complex have been demonstrated to form a stable group distinct from other Rickettsia species (Figure 1) [20–22]. We found that within this cluster they consistently formed two phylogenetic clusters (Figure 2A). 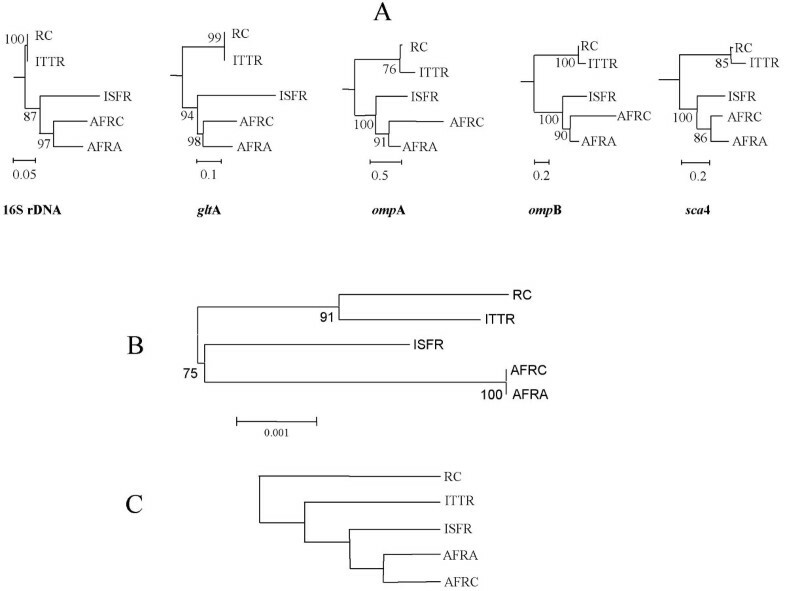 One of these clusters included R. conorii and ITTR, and the other, AFR isolates and ISFR. Using MST, we identified five genotypes. However, using pairwise comparison of spacer sequences, we identified only four genotypes similar to those obtained by MLST. MST-based phylogeny also demonstrated a similar pattern (Figure 2B). Serotypically, we could identify four serotypes which, according to the definition of species proposed by Philip , would classify them as different species: 1) R. conorii isolate Malish; 2) ITTR; 3) AFR; and 4) ISFR. These four serotypes also showed distinct MST genotypes. We demonstrated a discrepancy between the genotypic homogeneity of these rickettsiae, which classified them within the R. conorii species , and their MST genotypic, serotypic, geographic, and pathogenic heterogeneity. For ITTR, an additional discrepancy was observed between its phylogenetic and serotypic classifications (Figures 2A and 2B versus 2C). Such findings are in accordance with those of Walker et al. who had shown substantial differences between ITTR and R. conorii isolates . We also agree with these authors who hypothesized that all members of the "so-called" R. conorii complex belonged to the R. conorii species . We have demonstrated that R. conorii and closely related strains exhibit a high level of conservation in nucleotide sequence despite genotypic specificities, and phenotypic specificities including serotyping, epidemiological and clinical characteristics. Therefore, according to the accepted criteria of the ad hoc committee on reconciliation of approaches to bacterial systematics which allow the creation of subspecies for genetically-close isolates which express phenotypic differences , we are justified in creating new subspecies for these organisms. Rickettsia conorii (Brumpt 1932). The characteristics of this taxon are similar to those described by Weiss and Moulder for the species . The species contains four subspecies. The minimal degree of pairwise nucleotide similarity of the R. conorii species is of 99.8 % for 16S rDNA, 99.4 % for glt A, 98.3 % for the 5' end of omp A, 98.6 % for omp B, and 99.3 % for sca 4, by comparison with isolate Malish. Rickettsia conorii subsp. conorii (co.no'ri.i N. L. gen. n. conorii, of Conor, in honor of A. Conor who, in collaboration with A. Bruch, provided the first description of fièvre boutonneuse in 1910 ). The characteristics are the same as those of the species. Transmitted to humans through the bite of Rhipicephalus sanguineus ticks. Grows in Vero cells at 32°C in antibiotic-free Minimal Essential Medium supplemented with 2 % fetal calf serum and 2 mg/ml L-glutamine. The type strain is Malish, ATCC VR-613, which was isolated in South Africa by J.H.S. Gear in 1946. This type is the most common and representative of the isolates of R. conorii subsp. conorii subsp. nov. The nucleotide sequence of the 16S rRNA, glt A, omp A, omp B, and sca 4 genes have been deposited in the GenBank database under the accession numbers, AF541999, U59730, U43806 , AF123721 , and AF163008 , respectively. To be classified as R. conorii subsp. conorii subsp. nov., a rickettsial isolate should exhibit a minimal pairwise nucleotide sequence similarity of 100%, 100%, 99.9%, 99.9%, and 100% for the 16S rDNA, glt A, omp A, omp B, and sca 4 genes, respectively, with those of R. conorii isolate Malish, ATCC VR-613. R. conorii subsp. conorii subsp nov. strain Malish has also been deposited in the official collection of the WHO Collaborative Center for the Diagnosis and Study of Rickettsioses in Marseille, France. Rickettsia conorii subsp. indica (in'di.ca N. L. gen. n. indica, from India, where the Rhipicephalus sanguineus tick providing the first isolate was collected). The characteristics are the same as those of the species. Transmitted to humans through the bite of Rhipicephalus sanguineus ticks. Grows in Vero cells at 32°C in antibiotic-free Minimal Essential Medium supplemented with 2 % fetal calf serum and 2 mg/ml L-glutamine. The type strain is Indian tick typhus, ATCC VR-597, which was isolated from a Rhipicephalus sanguineus tick collected in India by C.B. Philip in 1950. The nucleotide sequence of the 16S rRNA, glt A, omp A, omp B, and sca 4 genes have been deposited in the GenBank database under the accession numbers L36107 , U59730 , U43794 , AF123726 , and AF163005 , respectively. To be classified as R. conorii subsp. indica subsp. nov., a rickettsial isolate should exhibit a minimal pairwise nucleotide sequence similarity of 100%, 100%, 99.9%, 99.9%, and 100% for the 16S rDNA, glt A,omp A, omp B, and sca 4 genes, respectively, with those of R. conorii subsp. indica subsp. nov., isolate Indian tick typhus, ATCC VR-597. R. conorii subsp.conorii subsp nov. isolate Indian has also been deposited in the official collections of the WHO Collaborative Center for the Diagnosis and Study of Rickettsioses in Marseille, France; of the WHO and National Reference Collection at the Gamaleya Research Institute, Moscow, Russia, and of the WHO Collaborating Reference Center for Rickettsial and Bartonella-associated Diseases, CDC, Atlanta, USA. Rickettsia conorii subsp. caspia (cas' pi.a N. L. fem.adj. caspia, from Mare Caspium, the Latin name of the Caspian sea where the disease caused by this rickettsia is endemic). The characteristics are the same as those of the species. Transmitted to humans through the bite of Rhipicephalus sanguineus and R. pumilio ticks. Grows in Vero cells at 32°C in antibiotic-free Minimal Essential Medium supplemented with 2 % fetal calf serum and 2 mg/ml L-glutamine. The type strain is A-167, which was isolated from a Rhipicephalus pumilio tick collected in Astrakhan in 1992. The nucleotide sequence of the 16S rRNA, glt A, omp A, omp B, and sca 4 genes have been deposited in the GenBank database under the accession numbers L36100 , U59728 , U43791 , AF123708 , and AF163007 , respectively. The nucleotide sequence of the 16S rRNA, glt A, omp A, omp B, and sca 4 genes of AFR isolate Chad have been deposited in the GenBank database under the accession numbers AF510102 , AF510103 , AY112668 , AY643093, and AY643092, respectively. To be classified as R. conorii subsp. caspia subsp. nov., a rickettsial strain should exhibit a minimal pairwise nucleotide sequence similarity of 99.7%, 99.6%, 99.5%, 98.9%, and 99.6% for the 16S rDNA, glt A, omp A, omp B, and sca 4 genes, respectively, with those of R. conorii subsp. caspia subsp. nov., isolate A-167. R. conorii subsp. caspia subsp nov isolate A-167 has been deposited in the official collections of the WHO Collaborative Center for the Diagnosis and Study of Rickettsioses in Marseille, France, and of the WHO Collaborating Reference Center for Rickettsial and Bartonella-associated Diseases, CDC, Atlanta, USA. Rickettsia conorii subsp. israelensis (is.ra. el en' sis. N. L. gen. n. israelensis, from Israel, where the Rhipicephalus sanguineus tick providing the first isolate was collected). The characteristics are the same as those of the species. Transmitted to humans through the bite of Rhipicephalus sanguineus ticks. Grows in Vero cells at 32°C in antibiotic-free Minimal Essential Medium supplemented with 2 % fetal calf serum and 2 mg/ml L-glutamine. The type strain is ISTTCDC1, which was isolated from a Rhipicephalus sanguineus tick collected in Israel in 1974. The nucleotide sequence of the 16S rRNA, glt A, omp A, omp B, sca 4 genes have been deposited in the GenBank database under the accession numbers L36223 , U59727 , U43797 , AF123712 , and AF155058 , respectively. To be classified as R. conorii subsp. israelensis subsp. nov., a rickettsial isolate should exhibit a minimal pairwise nucleotide sequence similarity of 100%, 99.7%, 98.9%, 99.5%, and 99.8%, for the 16S rDNA, glt A, omp A, omp B, and sca 4 genes, respectively, with those of R. conorii subsp. israelensis subsp. nov., isolate ISTTCDC1. R. conorii subsp. israelensis subsp. Nov. isolate ISTTCDC1 has been deposited in the official collections of the WHO Collaborative Center for the Diagnosis and Study of Rickettsioses in Marseille, France, and of the WHO Collaborating Reference Center for Rickettsial and Bartonella-associated Diseases, CDC, Atlanta, USA. All rickettsial strains tested and their original sources are listed in Table 2. Rickettsial isolates for which sequences were not available were grown in Vero cell monolayers at 32°C in 150 cm2-cell culture flasks as previously described . When Gimenez staining demonstrated the cells have been infected heavily, they were harvested using sterile glass beads and centrifuged at 12,000 g for 10 min, resuspended in fresh medium and stored at -70°C until purification of nucleic acid was carried out. All rickettsial stocks were tested and shown to be free of Mycoplasma sp using a 16S rDNA-based PCR assay as previously described . ¶ Centers for Disease Control, Atlanta, GA, U.S.A. When available, we used gene sequences present in GenBank. The accession numbers for these sequences are reported at the end of the manuscript. Missing sequences were obtained in this study. Genomic DNA was extracted from 200 μl of rickettsial suspension and from 57 Rhipicephalus pumilio ticks collected in Astrakhan  using the QIAamp Tissue Kit (Qiagen, Hilden, Germany) according to the manufacturer's instructions. For MLST, we used the previously described primers and PCR conditions to amplify 1,424-bp, 1,134-bp, 590-bp, 4,890-bp, and 3,028-bp fragments of the 16S rDNA , gltA , ompA , ompB  and sca4  genes, respectively, of 29 of 36 rickettsial isolates tested for which no sequences were available in GenBank, and 57 R. pumilio ticks. In addition, we amplified and sequenced the omp B and sca 4 genes of AFR isolate Chad which had not been determined previously. Primers were purchased from Eurogentec (Seraing, Belgium). PCR reactions were carried out in a Peltier model PTC-200 thermal cycler (MJ Research, Watertown, MA). Each PCR included a negative (distilled water) and a positive control (DNA extracted from R. montanensis isolate 2–4–6 using the QIAamp Tissue Kit [Qiagen]). PCR products were visualized after electrophoresis on a 1% agarose gel. Each amplicon was purified for sequencing using the QIAquick Spin PCR Purification Kit (Qiagen) according to the manufacturer's instructions. Sequencing reactions were carried out using PCR primers and the D-rhodamine terminator cycle DNA sequencing Kit (Applied Biosystems, Foster City, California) according to the manufacturer' instructions. Sequencing reaction products were resolved by electrophoresis with an ABI Prism 3100 Automated Sequencer (Applied Bioystems). Each base position was established twice in both the forward and reverse directions. For each gene, the pairwise sequence similarity among studied isolates and tick amplicons was estimated using the multisequence alignment program CLUSTAL W . Each isolate or tick amplicon exhibiting specific nucleotide substitutions within one or more of the five genes studied was considered a different MLST genotype. Then, we selected a representative isolate of each MLST genotype for further tests. When a MLST genotype incorporated more than one isolate, we selected the type strain or the first strain described in the literature as representative strain. In addition to AFR isolate A-167, we incorporated AFR isolate Chad in the phylogenetic study and the mouse immunization and MST assays because MLST sequence differences between both isolates were due to nucleotide substitutions as well as deletions. Distance matrices generated by DNADIST were determined under the assumptions of Kimura and were used to infer dendrograms by the neighbor-joining method  using the PHYLIP version 3.4 software package . Dendrograms were also constructed by data processing with the maximum-likehood and parsimony methods (DNAML and DNAPARS, respectively, in PHYLIP). A bootstrap analysis based on 100 randomly generated trees using SEQBOOT and CONSENSE in PHYLIP was performed to estimate the node reliability of the trees obtained by three phylogenetic methods . We amplified and sequenced the dks A / xer C, mpp A / pur C, and rpm E / tRNA-fMet intergenic spacers for each of R. conorii isolate Malish, ITTR, ISFR, and AFR isolates A-167 and Chad. Primers and methods were those described previously . Subsequently, spacer sequences were concatenated and used to infer the phylogenetic relationships among strains tested using the neighbor-joining method  as described above. For each R. conorii isolate Malish, ITTR, ISFR, and AFR isolates A-167 and Chad, five BALB/c mice were inoculated intravenously (tail vein) with purified bacterial suspension (0.1 ml containing 104 bacteria). The concentration of rickettsial suspensions was estimated using a plaque assay as previously described . On day 7, mice were boosted with a similar inoculum. On day 10, mice were anesthetized and exsanguinated by cardiac puncture . Sera from each group of five mice were pooled and stored at -20°C until used for microimmunofluorescence (MIF) serotyping. The MIF test was performed and the SPD was calculated using the method of Philip et al. . Each of the five rickettsiae tested was compared with each other. The highest serum dilutions giving positive reactions were recorded as endpoint titer: SPD = (Aa + Bb) - (Ab + Ba), where Aa or Bb is -log2 of the endpoint titer between serum A or B and homologous antigen a or b and Ab or Ba is -log2 of the endpoint titer of serum A or B against heterologous antigen b or a. If the SPD was less than 3, the two isolates were assumed to belong to the same serotype. If the SPD was ≥ 3, the isolates were assumed to belong to different serotypes. The SPDs were used to construct a matrix, and then a dendrogram was constructed from the matrix by the unweighted pair group method with arithmetic mean (UPGMA) available in the MEGA2 software package . Yong Zhu, Pierre-Edouard Fournier contributed equally to this work. We are grateful to Drs N. Fetisova and I.V. Tarasevich for R. pumilio ticks. We thank Drs G.A. Dasch, E. Shaw and M. Khan for reading and corrections of the manuscript. The individual parts of the work presented in the paper were conducted as follows: YZ and PEF carried out the molecular genetic studies, analyzed the sequences and drafted the manuscript. ME participated in the design of the study and helped to draft the manuscript. DR conceived the study, and participated in its design and coordination and helped to draft the manuscript. All authors read and approved the final manuscript.